Ace Young (born November 15, 1980) is an American singer, songwriter, and actor. He gained national recognition while appearing on the fifth season of American Idol. 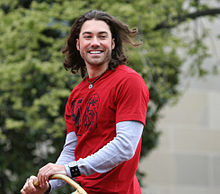 Young is married to American Idol season-three runner-up Diana DeGarmo. Young was raised in Boulder, Colorado and is the youngest of five sons. He began writing songs, singing, and taking voice lessons at age 9. In his youth he performed at shopping malls and recreation centers. He performed at various venues in Colorado and other western states, including performing the National Anthem at The Pepsi Center in Denver. Young graduated from Fairview High School in Boulder, Colorado in 1999. While in high school he participated in athletics, choir, and International Baccalaureate classes. He earned the rank of Eagle Scout during his senior year. After Young graduated from high school he wrote a song called "Reason I Live" that was featured on the soundtrack of the 2000 film The Little Vampire. In 2001, Young moved to Los Angeles, California to continue pursuing his music career. He ultimately met Brian McKnight and was given the chance to open for McKnight and New Edition. Just prior to auditioning for American Idol he landed a guest-starring role in an episode of Half & Half, playing a character named Ace Blackwell. After over four years in Los Angeles without a record deal, Young auditioned for American Idol in Denver, Colorado. His televised audition featured him singing Westlife's "Swear it Again." Young was introduced as Brett Young, with the name "Ace" marked in quotations. Later, he told producers he preferred to be called Ace and he was not referred to as Brett on the show again. Young made it through Hollywood week and sang George Michael's song, "Father Figure" for his live Top 24 performance. He also performed Michael Jackson's song, "Butterflies." The week that featured the music of Queen and the surviving members of the band as mentors, there was a brief controversy. American Idol's editing of Young's pre-performance package made it appear as if he had offended Brian May and the rest of the band by suggesting a change in the arrangement of "We Will Rock You." May came to Young's defense a few days later when he wrote a blog clarifying he and the band felt their mentoring session was a productive exchange of ideas for the arrangement of the song. The week Young was eliminated the theme was "Songs from the Great American Songbook," with Rod Stewart as mentor. Young sang "That's All." He changed his look for this performance, slicking his hair back and dressing up in a suit and tie. He received mixed reviews from the judges and was joined by Chris Daughtry and Paris Bennett in the bottom 3. After his elimination Young was a guest and performed on MTV's Total Request Live. He was the first Idol contestant to be on MTV directly after elimination. Young also returned home to perform at the Pepsi Center in Denver. He was named one of People Magazine's "Hottest Bachelors" on June 16, 2006. He spent the summer of 2006 on the annual American Idol Top 10 tour, and afterwards released his first single, "Scattered," (co-written with Elvio Fernandes) as a digital download on iTunes. The song reached the Top 50 on the Hot Adult Contemporary sales chart. He also put together a band and started playing gigs around the country. Young performed at the 2006 Walt Disney Christmas Day Parade along with fellow idol finalists Paris Bennett, Kevin Covais, and Mandisa. He also formed a charity called "Highrollers With Heart" that raised $300,000 to help Children's Hospital in Denver build the Family Hospitality Suite. Young wrote the chorus for Daughtry's debut single, "It's Not Over." The song was nominated for Best Rock Song at the 50th Annual Grammy Awards nominations on December 6, 2007. Along with co-writers, Gregg Wattenberg, Mark Wilkerson, and Chris Daughtry, Young received a songwriting nomination. In January 2008, Young was named a Celebrity Ambassador for the Muscular Dystrophy Association (MDA). He appeared on the show every year from 2007 until 2012. In 2011 he hosted the New York MDA telethon. In 2012 he participated in Labor Day weekend's pre-taped MDA "Show of Strength" telethon. He continues to work with MDA through the Nashville chapter. In April 2008 he released another single, "Addicted," and promoted the song and subsequent video on TNA wrestling. He worked with Bon Jovi producer Desmond Child on his self-titled and self-funded debut album, releasing it independently in July 2008. He wrote seven of the eleven songs on the cd and released it independently to stores and digital retailers. On May 12, 2008 he appeared on the Fox series Bones alongside season-six American Idol contestant Brandon Rogers. In the episode "Wannabe in the Weeds," Young played an arrogant karaoke singer who was gruesomely murdered. His character sang a Nickleback song, "Far Away." On November 23, 2008, he made an appearance as a bachelor on the VH1 show Rock of Love: Charm School. Young made his Broadway debut as Kenickie in the revival of Grease on September 9, 2008. He played the role until the show closed January 4, 2009. Young later joined the national tour of Grease in December 2009, this time playing Danny Zuko. He left the tour on February 14, 2010. After "Grease," Young took over the role of Berger in the Broadway revival of Hair, succeeding Will Swenson. Young took over the role in March 2010 and remained with the production until the show closed June 27, 2010. After Hair, Young started a now defunct music company, called "Young Brothers Entertainment." The company was partnered with Mailboat Records for digital releases but none of the associated acts ever released music through the company outside of Diana DeGarmo and Young himself. Young's single "I Wanna Fall in Love Again" was released on iTunes in May 2012. Young starred as Joseph in the U.S. national tour of Joseph and the Amazing Technicolor Dreamcoat alongside DeGarmo as the Narrator from January 2014 to April 2015. Young lives in Nashville, Tennessee with his wife, Diana DeGarmo. The couple met in 2010 while appearing in Hair on Broadway. They got engaged on the May 23, 2012, American Idol season finale when Young surprised DeGarmo with an on-air marriage proposal. Young and DeGarmo were married on June 1, 2013 in Los Angeles at the Luxe Sunset Boulevard hotel. Young was previously engaged in 2009 to actress Allison Fischer. Wikimedia Commons has media related to Ace Young. ^ "Happy Birthday, Ace Young!". American Idol official site. November 15, 2010. Archived from the original on November 18, 2010. Retrieved August 18, 2012. ^ a b c "Ace Young: Spotlight on Celebrity Role Model". lafamily.com. Archived from the original on 2012-05-27. Retrieved 2012-08-19. ^ "Season 5: Ace Young". American Idol (official site). Retrieved May 27, 2012. Question: "Do you have any formal singing training?" Answer: "Voice lessons." ^ Parker, Penny (2006-05-05). "Parker: Already basking in afterglow, Ace Young to meet John Elway". Rocky Mountain News. Archived from the original on July 9, 2006. Retrieved 2006-06-06. ^ The Little Vampire Soundtrack. October 17, 2000. New Line Records. ^ "For The Record: Quick News On Tupac Shakur, Ace Young, Gary Glitter, Snoop Dogg, Lara Croft, Saves The Day & More". MTV. 2006-03-16. Archived from the original on 2 May 2006. Retrieved 2006-06-07. ^ "Queen's Brian May Addresses 'Idol Fallout'". www.queenzone.com. Retrieved 2015-10-30. ^ "'Idol' Finalists Get Record Contracts: Kat, Chris, Ace and Elliott's post-deals". America Online. 2006-06-05. Archived from the original on 2008-05-16. Retrieved 2006-06-05. ^ Dehnart, Andy (June 15, 2006). "Taylor Hicks is People's hottest bachelor; Ace Young, Ryan Seacrest are also listed". Reality Blurred. Retrieved August 18, 2012. ^ Moss, Corey (January 24, 2007). "Idols Now: Is Daughtry Pal Ace Young's Career Ready To Launch?". MTV News. ^ "Strange Grammy Nominees: Barack Obama, Tia Carrere". PEOPLE.com. Retrieved 2015-10-30. ^ "MDA Show Of Strength™ Features Star-studded Talent, Focuses On Families". PRNewswire. mdausa.org. August 9, 2012. ^ "Muscle Team Nashville". muscleteamnashville.org. ^ "'Idol' alum Ace Young's dream is coming true - USATODAY.com". usatoday.com. ^ mj santilli. "Ace Young - Debut Album - Drops Today! • mjsbigblog". mjsbigblog. ^ BWW News Desk (3 December 2008). "GREASE to Close on Broadway January 4, 2009". BroadwayWorld.com. ^ BWW News Desk (30 November 2009). "Ace Young, Allison Fischer, Laura D'Andre, Jesse JP Johnson and Jamison Scott Join GREASE TOUR". BroadwayWorld.com. ^ "National Tour of Grease to End in May; Franklin to Join Cast". Playbill. Archived from the original on 2012-09-07. ^ "Kyle Riabko, Ace Young and Diana DeGarmo Are Hair's New Headliners; Complete Cast Announced". Broadway.com. ^ ""Eyes Look Your Last": Tony Award-Winning Revival of Hair Closes On Broadway June 27". Playbill. Archived from the original on 2010-06-28. ^ BWW News Desk (19 August 2013). "Diana DeGarmo and Ace Young to Lead JOSEPH AND THE AMAZING TECHNICOLOR DREAMCOAT National Tour; Launches 3/4 in Cleveland". BroadwayWorld.com. ^ "Ace Young and Diana DeGarmo Get Engaged on American Idol Finale". May 23, 2012. Retrieved May 23, 2012. ^ Helling, Steve. "Ace Young Marries Diana DeGarmo". People. Retrieved June 1, 2013. ^ "'American Idol' Alums Diana DeGarmo and Ace Young Set a Wedding Date, Bride-To-Be Picks A Wedding Dress (EXCLUSIVE DETAILS)". Celebuzz. ^ mj santilli. "Ace Young Broke Off His Engagement 2 1/2 Months Ago". mjsbigblog. This page was last edited on 24 February 2019, at 00:50 (UTC).